U.S. Marine Lance Cpl. 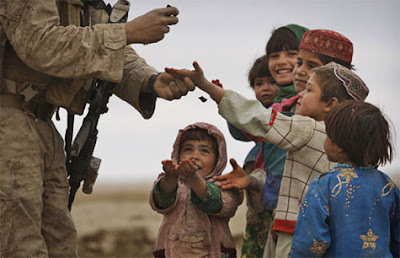 Grayson Barnette of Maryland from the 4th Light Armored Reconnaissance Battalion gives candy to Afghan children during a patrol in Khan Neshin. Wonder if they could grow sugar cane over there? Not enough water, I guess. Reminds me of the "Wizard of OZ." Still, though, there must be a better crop...and hope someday 'these kids' make that 'world' over there a better place.